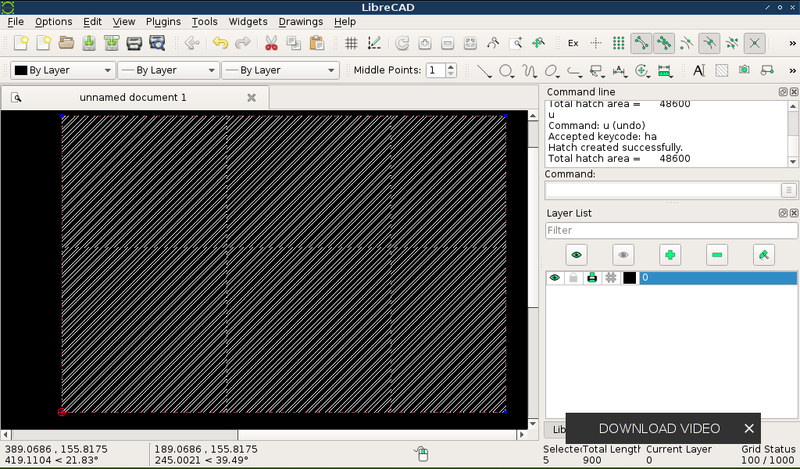 I am sorry, I think there is something strange when I want to do "hatch", I can't find ansi32 hatch pattern, I compile librecad 2.2.0.
does librecad provide "default hatch" file like autocad? LibreCAD only has ansi31. But you can make yourself any pattern you want. Look in the Librecad folder resources / patterns. Each pattern is a dxf file. You may open ansi31.dxf, edit it to look like ansi32 (delete every third line) and save it in the same folder as ansi32.dxf. Or draw a completely new pattern of 100x100 units/mm size and give it a name. Maybe you have to restart LibreCAD after that. @dellus thanks sir... I will try. If this is correct, I can add it to the pattern folder for further releases. The trick is, that the pattern in the 100 x 100 square must be continuous on all 4 sides. You can check this by copying the pattern and applying it to all 4 sides of the origin. The ansi31 pattern has 50 lines per side. There is no special pattern, so any number of lines will work, until the distance between the lines is constant. The ansi32 pattern in contrast has a lowest common factor of 3, means 2 lines and 1 gap. So the number of segments per side has to be a multiple of 3. I used a factor of 100 / 48 for the distance between lines and gaps. Then started with a gap in the main diagonal and applied the pattern lines on the left and bottom for the ansi32.dxf file.